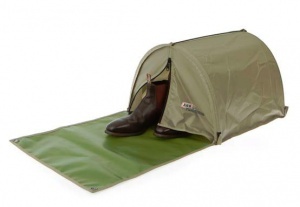 hen designing the new range of SkyDome swags, the boot mat found on numerous other swags was intentionally omitted due to the nature of these flaps getting dirty and soiling the swag when rolled up. The BootSwag is ARB's creative solution to this challenge and features a zippered front flap, large boot mat and a dome section made from waterproof Oxford fabric. Being a standalone item, the BootSwag can also be used with other touring products including the ARB roof top tents where it can be placed at the foot of the ladder.